The 2005 winner of the fifth annual $1000 National High School Calculus Student Award is ninth-grader Sam Beck of Jackson Preparatory School, Jackson, Mississippi. His nominator Barbara Tompkins called him "the most passionate student of mathematics that I have encountered in my seventeen years of teaching." On the AMC-12 (American Mathematics Competition for high school students), he scored highest in the state of Mississippi for three consecutive years, beginning as a seventh-grader. In the 2005 state Mu Alpha Theta competition, Sam placed first on the calculus written exam and in advanced ciphering. At the 2005 Mississippi School of Mathematics and Science tournament, he again placed first on the written calculus exam and the advanced ciphering. In academic competition sponsored by the Mississippi Private School Education Association, Sam won first place in algebra II (2002-2003), first place in calculus (2003-2004), and first place in history (2004-2005). Tompkins reports that her BC Calculus advanced placement class of high school seniors "loved their ninth grade underclassman. His love for calculus and his natural talent meant that he frequently helped his older classmates. It was amusing and gratifying to hear them say, 'Sam, what do you think?' or 'Let's ask Sam.'" Sam also is currently a violist with the Mississippi Youth Symphony Orchestra. 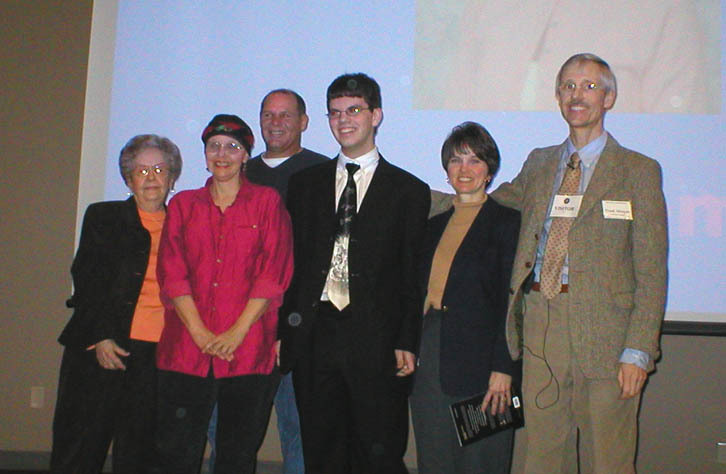 Sam Beck (center), with family on his right and nominating teacher Barbara Tompkins on his left, receives the 2005 National High School Calculus Award from Professor Frank Morgan of calculus.org and Williams College at a special assembly at Jackson Preparatory School in Jackson, Mississippi, January 11, 2006. The award comes from calculus.org, based at the University of California at Davis, Wake Forest University, and Williams College. For more information contact Head Judge Hugh Nelson Howards or Joel Hass of calculus.org. Results from last year can be found at Previous Winners.